Some people tell of relatives who were "never the same since the last operation". Yet other people tell of personal experiences of reduced ability to concentrate, reduced attention span, and of memory problems after undergoing an operation. These changes are sometimes severe enough to alter the personality of the affected person, or to interfere with their ability to perform normal activities. These changes may even be so severe that some elderly people actually become demented after undergoing an operation. Such postoperative alterations in mental function have been described, discussed, and studied since 1955 (see discussion in Hole 1982). Unfortunately, many of the complaints suffered by those reporting mental changes after undergoing an operation under anesthesia are frustratingly difficult to measure objectively (Fassolt 1986). Inability to concentrate. For example, they cannot concentrate sufficiently to read a book or newspaper. Memory dysfunction. For example, they have a reduced ability to remember things recently said or done. Reduced ability to perform arithmetic. For example, they make mistakes with normal money transactions while shopping. An enormous amount of effort has been invested in studying this problem. The final view of this research is that POCD is a real problem affecting a significant proportion of people after undergoing an operation. Several studies excluding persons with initial stages of dementia, alcoholism, and those who underwent heart operations, reveal the following approximate figures for percentages of people experiencing POCD (Hanning 2005, Monk 2008). These are fascinating statistics. They mean that undergoing an operation can affect the mental function in quite significant numbers of people, revealing POCD to be an unrecognized but significant form of postoperative morbidity. Nearly all physicians, together with nearly all non-medical people, as well as the popular press, attribute these changes in mental function to the effects of anesthesia. Many of these people even believe that anesthetic drugs remain in the body for many months exerting a deleterious effect upon mental function. This is the real world of people who themselves have experienced POCD, or who have relatives who manifested POCD. Most people believe anesthesia is the cause of POCD, yet seem to forget that administration of anesthesia is never done without a purpose. This is a curious form of socio-culturally induced selective blindness. No one undergoes anesthesia without undergoing an operation. Anesthesia is always administered to make surgical procedures, or an operation, possible. So POCD is always a consequence of the combined effect of anesthesia plus surgery upon mental function. In fact the effects of surgery upon the functioning of the body can be quite profound. For example, major surgery has an effect upon body function comparable that due to being hit by a truck, only the wounds are tidier. Recovery from such major injury also has a long-lasting effect upon mental and body function. There are also several other factors determining whether a person develops POCD. In fact, studies reveal reasonably consistent information about who is most likely to develop changed mental function after anesthesia and operation. These are listed below. POCD is just as likely to occur after operations under loco-regional anesthesia as under general anesthesia (Hanning 2005, Neubauer 2005). More likely after major operations than minor operations (Hanning 2005, Neubauer 2005, Monk 2008). More likely after heart operations than other types of surgery ( van Dijk 2002). More likely in aged than in younger patients (Neubauer 2005, Monk 2008). More likely in older patients with high alcohol intake / abuse (Hudetz 2007). People with higher preoperative ASA-scores, (see page Is General Anesthesia Dangerous? ), are more likely to develop POCD (Monk 2008). People with lower educational level are more likely to develop POCD than those with a higher educational level (Newman 2007, Monk 2008). People with prior history of a stroke, even though there is complete functional recovery, are more likely to develop POCD (Monk 2008). More likely in the elderly with pre-existing declining mental functions, termed MCI (Mild Cognitive Impairment) (Silverstein 2007). MCI is a transitional zone between normal mental function and evident Alzheimer's disease or other forms of dementia. It is insidious, and seldom recognized, except in retrospect after affected persons are evidently demented. Delirium and severe worsening of mental function is very likely in those with clinically evident Alzheimer's disease or other forms of dementia, as well as those with a history of delirium after previous operations (Meagher 2001). The great variety of factors predisposing to POCD, or altered mental function after anesthesia and surgery, means that there is not one single cause or mechanism inducing this unfortunate condition. Accordingly, POCD is not explained by the simple one-liner: "Anesthetic drugs linger for a long time in the body and cause POCD." In reality, what does happen is that the effects of anesthesia and surgery on the body interact with the body through a variety of different mechanisms within the body to induce a final chain of events expressed as the cognitive dysfunction manifested by those with POCD. So what are some of the possible causes of altered mental functioning after anesthesia and surgery? Residual effects of trace concentrations of anesthetic, sedative, and painkilling drugs. Hyperventilation induced prefrontal dysfunction. (This will be discussed on another page of this website). Many different types of drugs are used for medicinal purposes. To be effective the concentration of any drug must be above a certain level, otherwise that drug will not exert an effect. The body eliminates drugs by metabolism to inactive or other active forms, as well as excreting unchanged as well as metabolized drug in feces, or in urine, and sometimes even in exhaled air. The fact that a drug no longer exerts an effect upon the body does not mean that drug has been eliminated from the body - it simply means that the concentration of that drug within the body is too low to exert the effect for which that drug is used. Residual low concentrations of any drug may still exert effects upon the body as well as mental processes. Drugs used to provide general anesthesia are no different. It takes several days before all anesthetic drugs administered to make an operation possible are eliminated from the body. These trace concentrations may exert an effect upon mental processes such as alertness, concentration, and memory, for several hours or days upon a person who has undergone an operation under general anesthesia. This is also one of the reasons why anesthesiologists always forbid people to drive an automobile or any other machinery, or to perform responsible intellectually demanding work for 24 hours after an operation performed under general anesthesia. Anesthesia causes no pain, but operations are painful. Accordingly, people continue to use painkilling drugs after an operation to relieve the pain caused by the operation. The use of painkilling drugs may continue for days to weeks after an operation. Many drugs used to relieve pain also affect mental processes such as alertness, concentration, and memory. Opiates (morphine-like drugs) are good examples of drugs exerting just such effects upon mental processes. Residual concentrations of general anesthetic drugs as well as the effects of painkillers explain many of the features attributed to POCD occurring during the first few days after surgery. A surgical procedure is a form of injury, and the larger the injury, the larger and longer lasting the effects of operation upon the body. I discussed this earlier in this piece, comparing the metabolic effects of major surgery to being hit by a truck, only with tidier wounds. Everyone understands that recovery from such an accident with a truck will take a long time. Major surgery is the same. It also causes major injury to the body, even though the intention is to cure or manage a disease. 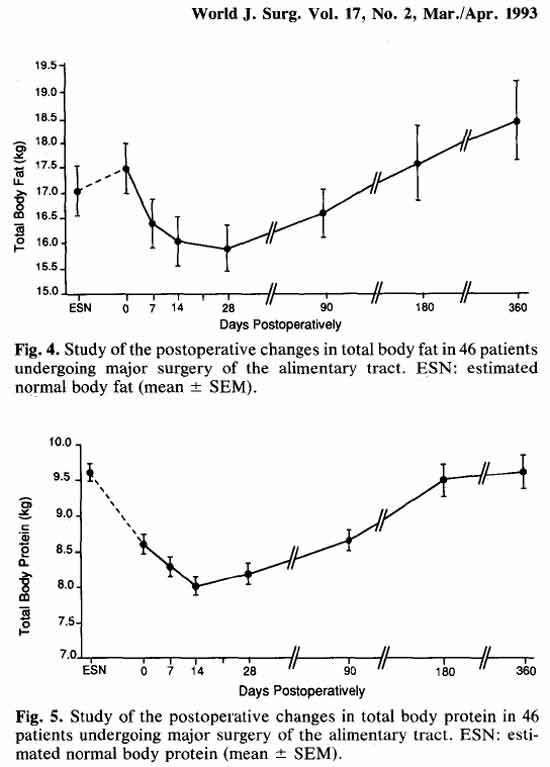 Major metabolic changes lasting weeks and months occur in the body during recovery from major surgery (Hill 1993). All these changes in body metabolism explain why people recovering from major surgery are easily tired, cannot concentrate, have memory deficits, and are not as alert as a healthy person for up to several months after undergoing major surgery (Rasmussen 1999). POCD, or any other form of abnormal mental function developing after surgery is more likely in the aged than the young (Neubauer 2005, Monk 2008), in those with a high alcohol intake (Hudetz 2007), in those with lower IQ (Newman 2007), in those with prior history of a stroke (Monk 2008), those with pre-existing declining mental functions MCI (Mild Cognitive Impairment) (Silverstein 2007), as well as in those with clinically evident Alzheimer's disease or other forms of dementia (Meagher 2001). These facts mean it is likely these groups of patients have a diminished neuronal reserve, (also termed "cognitive reserve"). So when this cognitive reserve malfunctions due to the effects of drugs and the metabolic effects of surgery, they develop very evident subjective and externally evident signs of altered mental function such as: delirium, evident dementia, reduced alertness, inability to concentrate, and poor memory function. PTSD is a disorder that sometimes develops after undergoing one or more traumatic events that threatened or caused physical harm to themselves or loved ones. Usually PTSD develops after undergoing or witnessing violence, disasters, and accidents. The following manifestations and disabilities are typical of PTSD (Marshall 2001, PTSD-criteria). Inability to concentrate, memory lapses. Medical illness is more frequent. Increased burden to spouse or partner. Psychological studies of, patients having undergone operations reveals a reasonably high incidence of PTSD after having undergone anesthesia and operation. For example the percentage of patients developing PTSD after anesthesia and surgery for various conditions are: about 23% after breast cancer surgery (Shelby 2008), about 25% after peritonitis secondary to abdominal operations (Levenson 2007), 20.7% after hospitalization for civilian injuries (Zatzick 2008), 56.3% after experiencing awareness during an operation performed under general anesthesia (Osterman-2001). These are very high percentages. Anesthesia and surgery may actually cause more dysfunction than most clinicians seem to think. The development of PTSD after anesthesia and surgery is a real possibility. Accordingly, PTSD should always be considered in the differential diagnosis when a patient, or their relatives, tell of altered mental function after anesthesia and surgery. People reporting changed mental function after undergoing an operation should be taken seriously. The discussion above reveals this to be a real and serious problem, and one which potentially has an enormous impact upon the personal functioning of the individuals concerned, as well as a significant impact upon their surroundings and the societies in which they live. Management should be serious and efficient. Why efficient? That sounds cold and unpleasant. Actually, efficiency is of utmost importance. Delay and incorrect management reduces the chance of successful management, as well as increasing the distress of the individuals concerned and their families. Rapid placement of people into correct treatment regimes improves the chances of successful management, and means the incurable are placed in appropriate support programs. Here are some personal thoughts regarding general management of POCD and postoperative altered mental function according to when they occur, and how long they last. Up to 1 week postoperative: Consider the cause to be the residual effects of anesthetic drugs, the effects of painkillers, and the metabolic effects of surgery. Manage patients symptomatically. Longer than 1 week postoperative: Consider the metabolic consequences of major surgery, other comorbidity, and the effects of medication. If these do not explain the existence of the observed postoperative changes in mental function, consider referral for neurological and / or psychiatric advice. Manage clinical manifestations symptomatically, and according to local protocols. Longer than 1-3 months postoperative: Consider the metabolic consequences of major surgery, other comorbidity, and the effects of medication. After one month, most recovery from the metabolic effects of surgery should have occurred, and any medication for pain or sedation should have long been stopped. After this time period, one should also start thinking about whether the effects of anesthesia plus operation have revealed a person with pre-existing abnormal mental function due to the initial phases of some neurological disorder, or a dementing process. The most efficient and rapid method of diagnosis of these conditions are CT-scan and MRI-scan of the brain. These will reveal the presence of most neurological and dementing disorders. If this is evident on the scans, then these unfortunate people can be placed in the appropriate neurological management and support programs. This is a sad occasion for those affected, but there is often little that can be done for many of these people. However, it does mean that they are placed in appropriate care programs, and their families know what has happened. The other group of patients with prolonged changes in mental function are those who develop PTSD. People with PTSD will have normal scans, and should be referred for appropriate neuropsychiatric assessment and management. This discussion is short, and only touches on this fascinating, but very troublesome problem. Nonetheless, it does provide a starting point for understanding some of the possible causes of postoperative changes in mental function, by revealing these changes to be products of complex interactions between the minds and bodies of individuals with the effects of anesthesia and surgery. Moreover, it provides a way of explaining the causes of this problem to patients and their relatives.